Why Choose a Contextual Help System over a Learning Management System? Team collaboration, task automation, data security, employee productivity, and return on investment are the common business pursuits. Toward those goals, companies have deployed SharePoint and Office 365. However, all these business goals are only attainable to the extent that employees actually use the platforms. At the same time, SharePoint and Office 365 adoption remains a major challenge to organizations of all sizes. The idea of "build it; they will come" seldom translates into reality. Typical of any digital technology solutions provider, we receive a lot of questions; common among them goes like this "in the effort to drive end-user adoption, why is a contextual help system like VisualSP better than a learning management system?" Below are points that answer this question. A Learning management system (LMS) provides online access to training materials and training programs. Whereas, a contextual help system (CHS) provides instant contextual help at the moment of need when completing a task. As it turns out, training programs seldom lead to end-user adoption of SharePoint and Office 365. But, access to instant contextual help is proven to increase usage and drive sustainable end-user adoption of the platforms. The short paragraphs below explain why this is the case. In the past, you had to travel to a location or visit your mailbox in order to access learning materials. Today, thanks to LMS's, you can take courses without being bound by geography. LMS's help instructors to deliver training materials and they help learners to take training programs. Over time, more functionalities, extensions, and integrations have been developed to improve authoring, delivery, and analytics. Students’ registrations, tests administration, and certification presentations are all part of the sophistication that continues to improve. More and more companies and educational institutions of all sizes are adopting LMS's such as Blackboard, Canvas, and Moodle to either compliment or replace their traditional classroom way of delivering training programs. Certainly, training programs help learners gain knowledge and improve skills. But, in the case of SharePoint and Office 365 end-user adoption, the approach is not as effective. At times, training end-users turns out to be a waste time. The main reason why training programs can only be minimally effective is that most of what end-users learn during classes is forgotten within hours. Also, even though end-users may learn how to use new digital tools, the instinctive pursuit of convenience will always discourage them to adopt them fully. No matter how thorough and extensive a training program is, after the event, end-users will always need help when it's time to implement. Typically, an IT team would jump in to provide support and guidance to the end-users. If the IT team delays, end-users will not get the help they need quickly enough and tasks will not be completed on time. If this kind of scenario repeats regularly enough, all will result in frustration and dampening of enthusiasm for using the applications. This is how end-user adoption of the Microsoft platforms stagnates or fails. In addition, as is always the case, weak adoption of new tools usually leads to detrimental outcomes such as temporary loss of productivity, a decline in workforce morale, and greater burden on the IT support teams. To avoid such eventualities, deploying a contextual help system is a better course of action toward successful and sustainable end-user adoption. Whereas LMS’s are built to transfer knowledge, CHS's are built to provide help exactly at the moment of need. When end-users get support every time they need it, an increase in usage of the applications is inevitable. And many more capabilities designed to fit end-user support requirements of any organization. Instant contextual help reduces the burden on your IT support team, freeing them from having to answer questions from end-users all day long and helping them focus on break-fix issues instead. In the case of VisualSP, end-users don't have to leave their working environment in order to find answers. Wherever they are within the SharePoint and Office 365 environment, whichever feature they are using, context sensitive answers will follow them. Instant answers means no more barriers to using and adopting a tool to the fullest. An LMS delivers training but a CHS delivers always accessible on-going contextual help. Curiously, over-time, bite-sized learning has happened to be the inevitable by-product of providing end-users with on-demand contextual help, making LMS's redundant after installing a CHS like VisualSP. 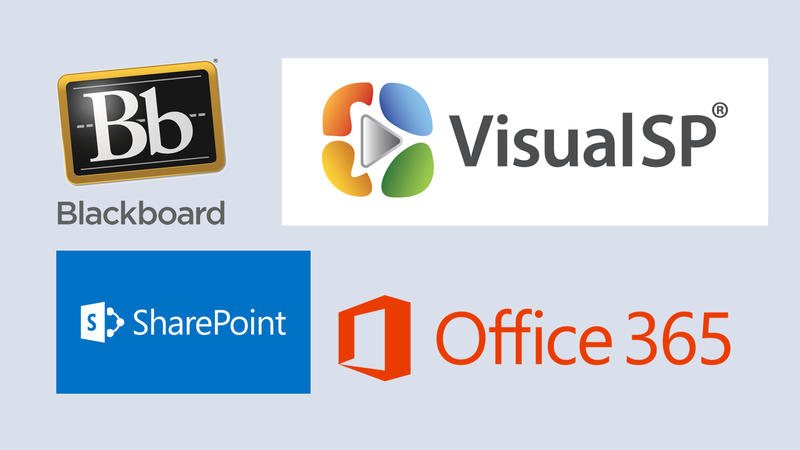 If sustainable end-user adoption of SharePoint and Office 365 is the objective, VisualSP is the way to go. Over 2 million end-users in over 200 companies are already using the system to boost end-user adoption.